There is a Service Contribution fee per room, per night, which must be paid directly at the hotel. The hotel will charge an additional fee per room, per night. This is a municipal tax due to environmental sanitation. Cribs subject to availability with prior reservation. Connected rooms subject to availability with prior reservation. These 410 square foot guestrooms are surrounded by a tropical landscape and are decorated in a sophisticated style. They each offer direct access to a swimming pool from a private terrace. These accommodations also have floor to ceiling windows, fine linens and a bathroom with double sinks and rainfall showerheads. Additional amenities include wireless Internet access, a port for multimedia devices and pay per view movies. Only for rooms with King size bed. Enjoy a pleasant stay in these splendid 410 square feet rooms, decorated in a modern style. They feature floor-to-ceiling windows as well as a furnished balcony, complete with a bathroom with dual-vanity and a rain shower. Guests in this category have access to the private lounge with daily continental breakfast, afternoon snacks, daily newspaper, private check in and check out, and concierge service. 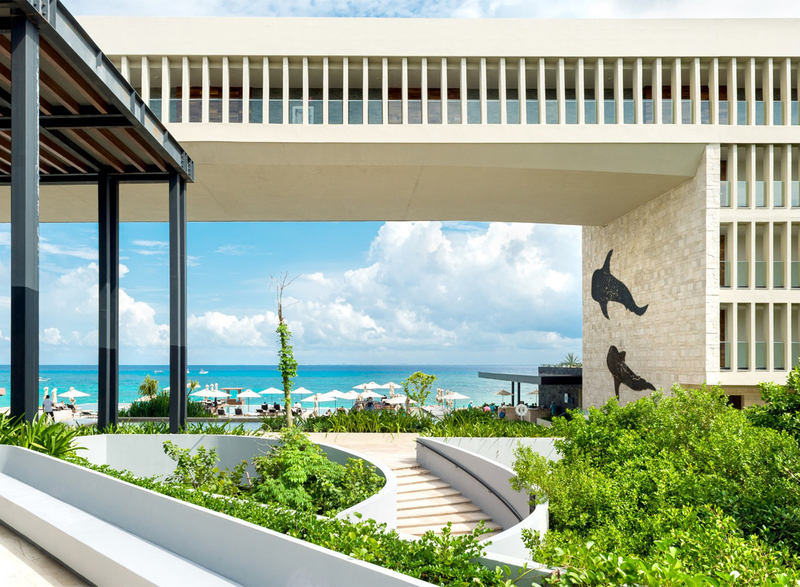 These 600 square foot guestrooms are right in front of the Caribbean Sea and are a great place to relax during your Playa del Carmen vacation. Listen to the sound of the waves from your furnished terrace and enjoy a sumptuous bathroom with double sinks and a rainfall shower. These accommodations also offer exclusive amenities like wireless Internet access and access to a private lounge with concierge services, continental breakfasts, evening cocktails and daily snacks. Cribs and connected rooms subject to availability with prior reservation.